On Saturday, October 24th from 10:00am – 3:00pm, Coast Range Forest Watch will hold our popular fall mushroom hike and workshop! 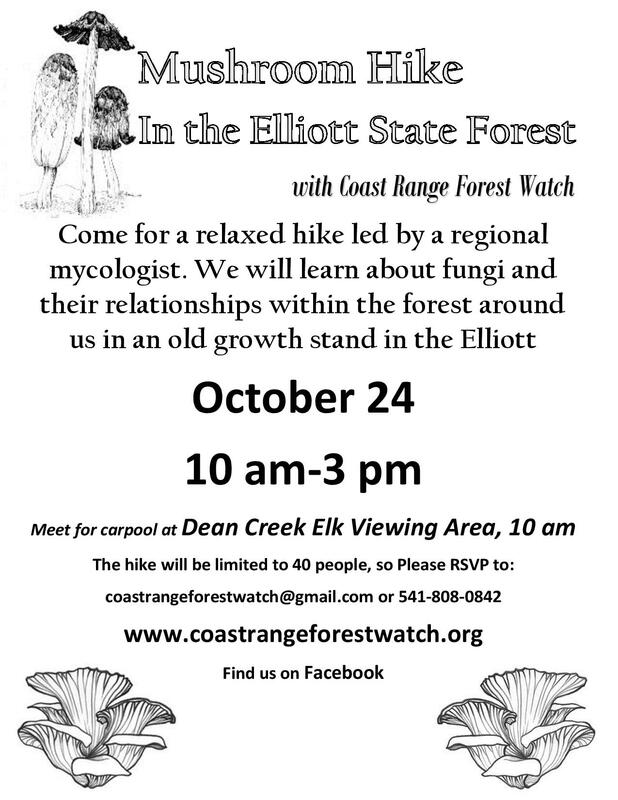 Maria Farinacci, a regional mycologist, will be leading a mushrooming excursion in the Elliott State Forest. We will learn about the ecology and biology of fungi as well as useful identification and harvesting techniques. This event requires a RSVP and we are suggesting a 5-10$ donation for our instructor’s time. To RSVP : send an e-mail to coastrangeforestwatch@gmail.com with the number of people in your party and we’ll add you to the list. There will be a cap of 40 attendees and we’re opening the RSVP up to our announcement list first, so reserve your spot now!